Philanthropy Australia and the Office for the Community Sector invited Melbourne’s philanthropy community to hear the Treasurer, Kim Wells MP, speak about the impact of the Victorian state budget on the not for profit sector. The Treasurer was introduced by the Acting Premier, The Hon Peter Ryan MP, who spoke about the government’s evolving relationship with philanthropy which has been growing through the development of the philanthropy and government working group. He also emphasised the important contribution of philanthropy in Victoria – noting that 80% of the trusts and foundations in Australia are based in Victoria. Apparently there are now 120,000 not for profits in “this great state” which deliver a gross value add to the community through both money and volunteer hours of more than $1 billion. The Acting Premier noted that the government is putting $4.5 million into the not for profit sector to support its sustainability, working on a common funding agreement, and a single government portal to assist with information about regulatory compliance. Have a look at this e-bulletin from the Office of the Community Sector which articulates this. The Treasurer gave a quick budget presentation – which is to say, he presented a lot of graphs very fast (it was a bit difficult to catch the detail). 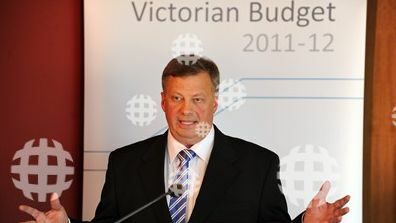 However, he emphasised that the government will be spending dollars on programs that make a difference, and that a lot of what they are doing is related to the changing population in Melbourne (which has seen the largest increase in population of all the capital cities in the last few years). Policies are trying to address issues raised by population growth and the downturn in manufacturing which has been offset to some degree by the uptick in financial services, professional services and healthcare. The Treasurer said that the state is facing lower productivity and they want to reduce the cost of regulation and work to reducing the $7 billion debt the state is facing. He blames part of this on a decrease in the GST that is returned to the state (previously it was 94 cents in every dollar of GST paid, now it is only 90 cents). The Treasurer also placed an emphasis on support for mental health services and initiatives, while talking about projects for bushfire and flood reconstruction and a new regional fund. While the Treasurer reiterated the valuable contribution of the not for profit sector and how important philanthropy is in being able to respond to and support community need and the severe budget constraints government is working under, the little voice at the back of my mind was asking – yes – but is philanthropy really working in partnership with government, or filling the gaps where government is failing or doesn’t recognise the same priorities? I am appreciative of both the State and Federal governments’ willingness to include philanthropic bodies in the conversation (as evidenced by the presentation to the Philanthropy Australia Annual General Meeting by Helen McDevitt, head of the Office of Not for Profit Sector in the Social Inclusion Unit of the Department of the Prime Minister and Cabinet) and to support community philanthropy through the Community Foundations Initiative. I would be interested to hear your views on how philanthropy and government are working together – and what you think is effective and useful. What are your experiences as a not for profit dealing with government? This entry was posted in Legislation, philanthropy, volunteering and tagged community foundations initiative, Helen McDevitt, Kim Wells, not for profit, Office for the Community Sector, Peter Ryan, Philanthropy Australia, social inclusion, Treasury, Victorian budget. Bookmark the permalink.